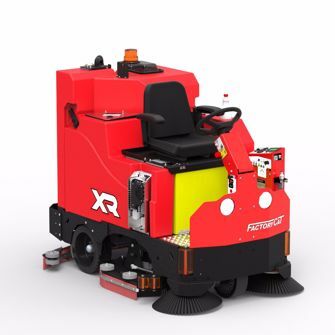 With two specialized cleaning systems and five deck sizes to choose from, Factory Cat XRs offer the results and capacity required to clean your unique application. Factory Cat use powerful motors, which typically run at only 50% of their capacity. This leaves power in reserve for times where heavy scrubbing is required, and prolongs motor life. The “Disk” XRs offer gimbaled brush drive and 45% more scrubbing power than competitive brands. The “Cylindrical” units reduce or eliminate dust mopping, by sweeping and scrubbing in a single pass. The scrub decks include adjustable wipers and curtains, for unmatched water control. All components are made of heavy gauge steel for durability and accessibility is designed in to simplify service work. The operator sits in a spring-suspension, fully adjustable, mid-back chair. The adjustable steering column, armrests, and front guard further enhance operator comfort and safety. With a powerful drive motor, these machines can climb steep ramps, and come standard with heavy duty tires. Features include an automatic parking brake, and reduction of transport speed while scrubbing or backing up.